After so many weeks of not watching the NFL, today rolled around without so much as the tiniest thought about football. Seahawk vs. Eagles, I don’t really care, it’s like rooting for Target to beat out Walmart during their black Friday event. blah. Today’s route took me to Ferndale via Axton Rd, one of the most dangerous stretches of road around for a cyclist. Axton is usually extremely busy and as you transition from County roads to Ferndale roads the nice wide paved shoulder completely disappears. Worse yet, is that the road becomes narrow and the traffic has worn the gravel next to the road leaving a sharp drop off that would spell disaster if you were to be pushed off the roadway. The whole Pilot/McDonalds/onramp/offramp intersection followed immediately by a narrow bridge over I-5 is best left for only thrill-seekers. I only rode this route today because I was so early on the road that there was almost no traffic to deal with. An alternate route is to go down Northwest and take Smith across over to the Haggen area. After the Axton/Main St. Ferndale danger zone the rest of this ride is and was really pleasant. I took a hard right just after crossing the Nooksack at Ferndale, going under the railroad bridge and following the road that skirts Vanderyacht Park. This route takes you along the backside of the Ferndale Cargill plant, recent victims environmental extortion. (Link) Cargil also happens to be one of the most recognizable landmarks in Ferndale, especially this time of year when they are displaying both the cross of Christ and the U.S. Flag. Going north from Ferndale on Portal, which turns into Enterprise, is nice road with occasional good views, more so in the spring/summer, of farmland and mountains. 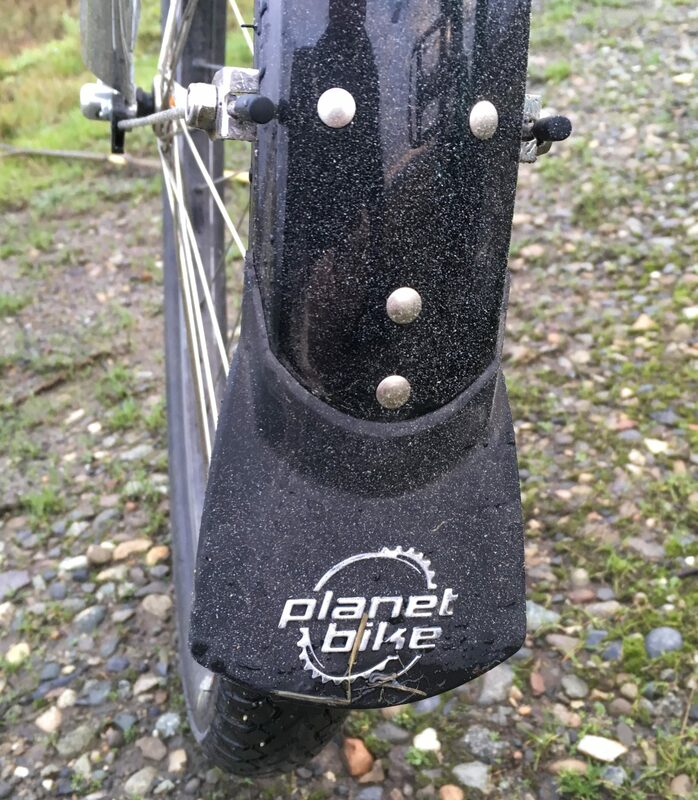 Today’s ride was nothing like spring/summer, it was typical NW fall/winter weather, cold, cloudy, wet, lots of puddles and with a sprinkle here and there. No danger of overheating. The rest of the ride is all farm land with the exception of Lynden(where you could stop in at Woods Coffee) and the bridge over the Nooksack. From Enterprise you turn right onto Birch Bay Lynden Rd and then at Lynden turn south on to the Guide Meridian. The Woods is this intersection, next to Safeway. If you have no plans for coffee you can bypass this whole intersection and it’s traffic if you turn right off the Birch Bay Lynden at the Green Barn. Continue south on the extremely wide shoulders of the Guide going through an easy roundabout and then over the Nooksack. You leave the Guide at the roundabout where Wiser Lake Rd meets the Guide. Go right/west on to W. Wiser Lake Rd. This road winds through much berry farm land before becoming Northwest Drive and continuing straight south. Along this stretch is Appel Farms and Boxx Berry if you are looking for a little bit of local food. Northwest hits Axton to complete the loop. I can say there is nothing super special about this loop, but it does cover a lot of typically Whatcom landscape and it can be hopped on at many spots or done in either direction that pleases you. Also there are plenty of spots other than my driveway to park and begin your ride. 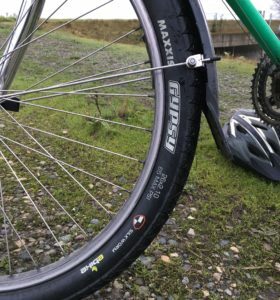 Maxxis Gypsy tires – I can’t really say enough about how good these tires work for our roads and weather. I’ve had these on my mountain/commuter bike for just about a year now and they have been flawless. They roll well, the have been sturdy when being force offroad or hitting potholes, they’ve had good cornering grip even wet, and I’ve had zero flats. Planet Bike Fenders – a must have if you are going to be riding the wet roads around here. I’ve had countless set of these on different bikes, they always fit well and I’ve never had on fail in anyway. 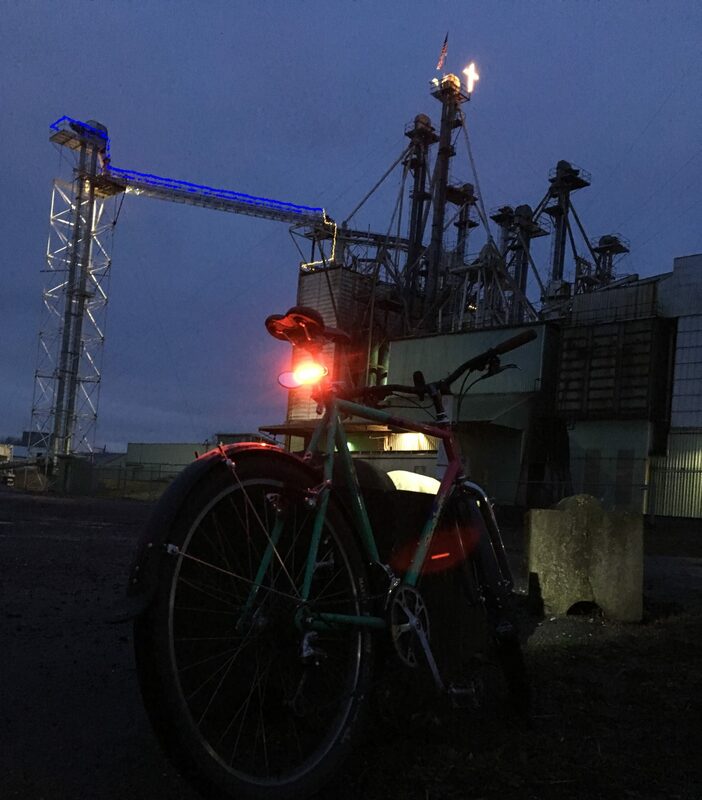 Not the most picturesque spot that Lynden has to offer. The God-awfully gaudy color scheme on my ‘89 Stumpjumper is not exactly picturesque either, but I find it to be ugly baby cute. Besides it’s a lovely to ride chromoly frame that I don’t have to look at as long as I am riding.